The magnificent Greek landscape with its unique beaches, magical mountains and small picturesque villages is the ideal environment not just for residents and visitors, but also for many successful Hollywood films. Lonely Planet has published some of the best Greek landscapes where top movie scenes have been shot. So, plan your trip and experience Greece. Mamma mia! 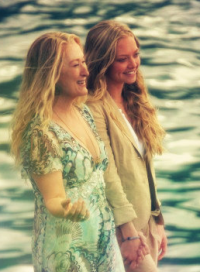 (2008): Unique scenes amidst crystal waters and lavish vineyards, with Meryl Streep, Pierce Brosnan and Amanda Seyfried singing, dancing and declaring in interviews how wonderful the experience was during the shoots on the islands of Skiathosand Skopelos. Captain Corelli’s Mandolin (2001): Nicolas Cage and Penelope Cruz starred in this adaptation of Louis de Bernières novel, set in the lavish green scenery of Kefallonia with its golden beaches and olive groves. The Big Blue (Le Grand Bleu, 1988): A unique production by Luc Besson, set in an amazing environment. Diving into the light blue waters of Amorgos and the Monastery of Hozoviotissa – literally built on a steep sea cliff – were some of the most memorable scenes of the movie. Lara Croft Tomb Raider: The Cradle of Life (2003): Angelina Jolie gives a spectacular acrobatic performance, against the stunning backdrop of the famous caldera in Santorini and breathtaking views. Before Midnight (2013): The last installment of the well-known trilogy by Richard Linklater, where Ethan Hawke and Julie Delpy redefine their relationship in beautiful Mani of Peloponnese. For Your Eyes Only (1981): Roger Moore as agent 007 does his miraculous stunts in the stone-built monasteries, hanging from the cliffs of Meteora, in a landmark James Bond story. Shirley Valentine (1989) & Bourne Identity (2002): Both movies were shot on an island that impresses with its beautiful main town (Hora), its extraordinary nightlife, parties on the beaches, and streams of celebrities who visit Mykonos every year. Zorba the Greek (1964): Who could forget the famous dance by Anthony Quinn in a classic film based on Nikos Kazantzakis book? Crete is an island that offers a natural diversity and infinite opportunities for exploration. Phaedra (1962) & Boy on a Dolphin (1957): Both films, the former with Melina Merkouri and the latter with Sophia Loren (the first foreign movie production in Greece), were shot on the small picturesque island of Hydra with its amazing mansions. Hydra is one of the first destinations that attracted the international jet-set. The Guns of Navarone (1961): This classic film with Gregory Peck, David Niven and Anthony Quinn, was filmed in the beautiful Medieval City of Rhodes, declared by UNESCO a World Heritage Site. Article from Greek News Agenda.